(ENG) This is the cover of the children’s book I wrote and illustrated a couple years ago named “Borobiltxo, Ilargiaren bila”(“Borobiltxo in search of the Moon”). It all begun with a bunch of illustrations I did in the Baccalaureat in Arts, which ended up being the rough version of the book. I sent a sample of the artwork to various publishing houses and “Aizkorri argitaletxea S.L” accepted my proposal. The book was published on May 2006. Recently it was nominated as the best publication of the year in the category of Young and Children’s literature on the “Euskadi Sariak” (Basque Literature Awards). The verdict on these awards was announced few days ago and my book turned out to be among the three finalists. Nevertheless, I am very happy with the nomination itself and who knows… maybe next time! 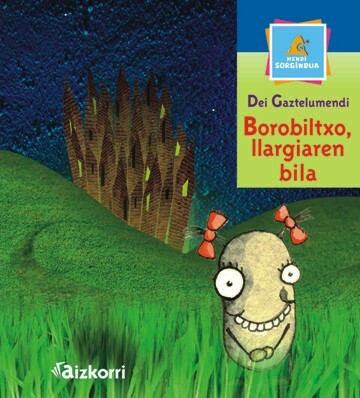 (ESP) Esta es la portada del cuento infantil que escribí e ilustré hace un par de años titulado “Borobiltxo, Ilargiaren bila” (“Borobiltxo, en busca de la Luna”). Todo comenzó con unas cuantas ilustraciones que realicé en el bachillerato artístico y que terminaron siendo una versión preliminar del cuento. Envié una muestra del trabajo a varias editoriales y “Aizkorri argitalexea S.L” se interesó por mi propuesta. El cuento fue publicado en Mayo del 2006. Recientemente fue nominado al premio a la mejor publicación del año en la categoría de literatura Juvenil e Infantil en los Premios Literarios Euskadi. El veredicto se dio a conocer hace unos días y Borobiltxo quedó finalista. De todos modos estoy muy contento con el mero hecho de la nominación ya que en un principio incluso dudaba de la posibilidad de publicarlo. Y quién sabe, quizá la próxima vez! (EUS) Honako hau da duela pare bat urte idatzi eta ilustratu nuen ipuinaren azala. Ipuinaren izenburua “Borobiltxo, Ilargiaren bila” da. Guztia bartxilergo artistikoan nengoela egindako ilustrazio batzuekin hasi zen, hauek ipuinaren lehen bertsioa osatu baitzuten. Lanaren kopia batzuk bidali nituen zanbait argitaletxetara eta “Aizkorri Argitalexea S.L” interesaturik azaldu zen proposamenarekin. Ipuina 2006ko Maiatzean argitaratu zen. Duela gutxi Euskadi Literatur Sarietarako izendatu zuten 2006ko argitarapenik honena bezala Haur eta Gazte literatura sailean. Lehengo astean eman ziren jakitera sarituak eta Borobiltxo hiru finalisten artean geratu zen... Hala ere oso pozik geratu nintzen izendapenagatik soilik. Gainera, nork daki... Hurrengoan beharbada! @hotmail.comOso ipuin polita, ilustrazioak haurrei asko gustatzen zaizkie baita ere borobiltxoren abentura. Nire bi alabak oso gustokoa dute.